Background and Context : Polytrauma is a leading cause of mortality in the developing countries and efforts from various quarters are required to deal with this increasing menace. Aims and Objectives : An attempt has been made by the coordinated efforts of the intensive care and trauma team of a newly established tertiary care institute in designing and improving the trauma care services to realign its functions with national policies by analyzing the profile of polytrauma victims and successfully managing them. Materials and Methods : A retrospective analysis was carried out among the 531 polytrauma admissions in the emergency department. The information pertaining to age and gender distribution, locality, time to trauma and initial resuscitation, cause of injury, type of injury, influence of alcohol, drug addiction, presenting clinical picture, Glasgow Coma score on admission and few other variables were also recorded. The indications for various operative interventions and intensive care unit (ICU) admissions were analyzed thoroughly with a concomitant improvement of our trauma care services and thereby augmenting the national policies and programs. A statistical analysis was carried out with chi-square and analysis of variance ANOVA tests, using SPSS software version 10.0 for windows. The value of P<0.05 was considered significant and P<0.0001 as highly significant. Results : Majority of the 531 polytrauma patients hailed from rural areas (63.65%), riding on the two wheelers (38.23%), and predominantly comprised young adult males. Fractures of long bones and head injury was the most common injury pattern (37.85%) and 51.41% of the patients presented with shock and hemorrhage. Airway management and intubation became necessary in 42.93% of the patients, whereas 52.16% of the patients were operated within the first 6 hours of admission for various indications. ICU admission was required for 45.76% of the patients because of their deteriorating clinical condition, and overall,ionotropic support was administered in 55.93% of the patients for successful resuscitation. Conclusions : There is an urgent need for proper implementation ofpre-hospital and advanced trauma life support measures at grass-root level. Analyzing the profile of polytrauma victims at a national level and simultaneously improving the trauma care services at every health center are very essential to decrease the mortality and morbidity. The improvement can be augmented further by strengthening the rural health infrastructure, strict traffic rules, increasing public awareness and participation and coordination among the various public and private agencies in dealing with polytrauma. After obtaining the permission from the concerned authority of the institution, the hospital records of all the 531 patients admitted with polytrauma in the emergency department from 20 December 2006 to 31 August 2010 were checked. The information pertaining to age and gender distribution, locality, time to trauma and initial resuscitation, cause of injury, type of injury, influence of alcohol, drug addiction, presenting clinical picture, Glasgow Coma score (GCS) on admission and few other variables was also recorded. A retrospective statistical analysis was carried out for all the patients who sustained polytrauma and who either underwent emergency operative procedure or were directly admitted to intensive care unit (ICU) from the emergency or after the operative procedure. At the time of admission to emergency ward, all the patients were examined simultaneously by the doctors of concerned speciality, and they were the part of the hospital trauma team. The trauma team at our institute comprises an anesthesiologist, neurosurgeon, orthopedician, general surgeon, and emergency physician, besides the well-trained paramedical staff and personnel who have been given special training in the trauma and disaster management. After the initial resuscitation, all the relevant investigations were carried out as per the institution protocols. These protocols were an amalgamation of various scores and guidelines such as injury severity score, GCS, advanced trauma life support guidelines, etc. The radiological and other investigations as well as deteriorating clinical parameters were the chief determinants for various immediate operative interventions. The main criteria for ICU admission comprised compromised airway/respiratory difficulty, GCS less than 12, deteriorating clinical condition and the clinical assessment by the intensivist. The methodology of treatment in ICU was basically supportive and symptomatic besides mechanical ventilation as and when required. Strict vigil monitoring, both invasive and non-invasive, was carried out on a patient to patient basis, which included non-invasive blood pressure (NIBP), pulse oximetry (SpO2), heart rate (HR), respiratory rate (RR), ECG, central venous pressure (CVP) and occasional arterial line, depending upon the specific requirement in a particular patient. All the routine and specific investigations were carried out in the ICU everyday as per the clinical condition of the patients. The treatment comprised antibiotics, gastric prophylaxis drugs, other supportive medications, fluids, enteral and parenteral nutrition, blood and its component therapy, general nursing care, etc., all of which were given after a thorough discussion with the attending team of doctors. At the end of study, all the data were compiled and arranged systematically. A statistical analysis was carried out with chi-square and analysis of variance (ANOVA) tests, using SPSS software version 10.0 for windows. The value of P<0.05 was considered significant and P<0.0001 as highly significant. A total of 1963 trauma patients were admitted to the emergency ward of our institute from 20 December 2006 to 31 August 2010. Out of these, 531 were polytrauma patients who sustained fractures of long bones, head injury, chest injury or internal organ injury. Majority of these cases were of roadside accidents that were brought either by relatives and friends or by the passerby and police personnel. In majority of the cases, trauma ambulance of our institution was pressed into service. 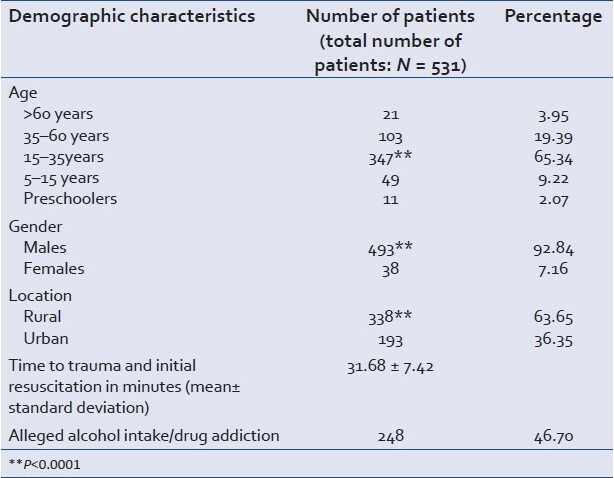 The demographic profile of these polytrauma patients is as shown in [Table 1]. The demographic profile of our patients throws a light on some significant facts. The number of patients who suffered roadside accidents was significantly higher (65.34%) in the age group of 15-35 years (P<0.0001). The male gender predominance (92.84%) among these victims was highly significant statistically (P<0.0001). Another finding of statistical significance (P<0.0001) was that majority of these victims (63.65%) belonged to rural background. The mean time for initiation of resuscitative efforts from the time of injury was estimated at about 31.68 min with a standard deviation of 7.42 [Table 2]. The number of two-wheeler victims (38.23%) was significantly higher than the cyclists/pedestrians (26.18%) and the persons on four wheelers (24.67%) like cars, jeeps, etc., who sustained injuries during roadside accidents. There were few patients who were admitted with sustained polytrauma after a fall from a height (4.9%) or after having sustained multiple injuries due to firing of bullets, crushing by the machines or multiple stab injuries (6.02%). All these patients were reported to the police after admission from the medico-legal perspectives. The mean GCS in these patients was estimated at 9.7 [Table 3]. The nature of injuries among these patients showed a variety of patterns. Two hundred and one patients suffered fractures of long bone and head injuries, while 41 patients suffered head injuries with maxillofacial trauma only. Eighty-eight (16.57%) patients suffered abdomino-thoracic injuries along with fracture long bones with or without cranio-facial injury component as compared to 63 (11.86%) patients sustaining blunt abdomino-thoracic injuries with or without cranio-facial trauma. Among 531patients, there were 138 patients who suffered exclusive long bones' fracture only without any other major trauma [Table 4]. The presenting clinical picture of these patients exhibited a huge diversity. Majority of these patients (51.41%) had severe hemorrhage and had developed a state of circulatory shock on admission. Ear, nose and throat bleeding was present in a significant percentage of population (43.50%) as also the loss of consciousness on admission. A hundred and six patients presented with chest injuries and associated breathing difficulties as compared to 87 patients with abdominal pain and evidence of internal hemorrhage. Associated pelvic fracture and spine injury component was present in 13.37 and 6.78% of patients, respectively. 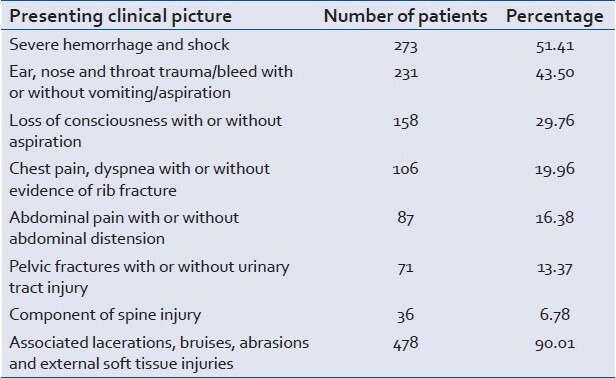 Majority of these patients presented with associated superficial bruises, abrasions, lacerations and external soft tissue injury [Table 5]. In 228 (42.93) patients, immediate airway protection and intubation was mandatory on account of their airway trauma, respiratory distress, deteriorating clinical condition, intra-oral bleed and progressively decreasing GCS. Among the 531 admissions, immediate emergency operative intervention was required in 277 (52.16%) patients who had sustained head injuries and blunt abdomino-thoracic injuries. Delayed operative intervention was carried out for 163 patients, majority of whom had suffered long bones' fractures only. The clinical condition of 243 patients mandated ICU admission, especially in patients with severe head injuries. Chest tube insertion was necessitated in 61 patients due to the presenting pneumo-hemothorax. Conservative management was carried out in 91 patients. Immediate blood transfusion was required in 388 patients either due to presenting picture of severe hemorrhage or due to ongoing losses in the emergency trauma ward. Mild to full ionotropic support was required to maintain hemodynamic stability in 297 of the patients. Beyond the functioning purview of the large institutions and hospitals, there are no universally established guidelines and protocols to provide a sound and effective pre-hospital care to these patients in the developing nations like India. The functional consequences of the system get reflected in patients getting least skilled care that in fact deserves the utmost attention. The disintegrated rural health infrastructure, semi-trained service providers, lack of proper diagnostic and resuscitative facilities, poor means of transportation, ineffective communication and lack of coordination among various health set-ups build up such circumstances which lead to below par care of these trauma victims. Though government of India, health ministry and medical education department have come out with various educational and training programs from time to time, unfortunately they have been successful only to a limited extent and lot is still desired to be done to strengthen these initiatives at grass-root level. Particular attention has to be paid to the adequate provision of infrastructure and facilities to strengthen the pre-hospital care as 70% of our population resides in rural areas and they receive the least benefits of our health system. Not only the polytrauma victims but also the other patients who require urgent medical attention fail to get the same due to lack of nationwide integration of our health services. In spite of so many surveys, studies and analysis which had been carried out, we are still at the same platform where we used to be about a decade earlier. Pre-hospital care is an important determinant as far as the prognosis and outcome in the polytrauma patients is concerned. , On the lines of ATLS, PHTLS guidelines have also been formulated and various courses and training programs are being successfully carried out throughout the world. The essence of these pre-hospital trauma guidelines revolves around the basic life support and the various measures to be adopted for airway, breathing and circulation control (ABC). The ultimate goals of pre-hospital care are rapid and accurate assessment, identification of shock and hypoxemia, initiation of intervention techniques and rapid and safe transportation. These guidelines have to be properly taught and disseminated at grass-root level so as to make them successful and to establish a universal protocol for trauma patients in developing countries. Many a times, these patients can be saved just by adopting the minor precautions and measures based on this PHTLS guidelines. The one big solution is the extensive training of paramedics in the transportation and resuscitation of critically injured patients. Our institute has come out with a novel and innovative reform as we have started a 1-year international academic and practical course in critical care for technicians and paramedics in collaboration with a Canadian University. This project is the first of its kind in the country, and the basic aim is to train these primary caregivers with the best of knowledge and practices of both the developing and the developed world. We believe and hope that this will go a long way in delivering quality pre-hospital services to the patients requiring emergency care. Similar course for critical care and emergency nursing is in the pipeline manly to deal with emergency crisis and disasters. Such projects can be easily undertaken by most of the private and government institutes and will definitely provide our society an increasing number of competent pre-hospital caregivers. The predominance of young adult males in our study affirms the fact that this age group is highly vulnerable to accidents as they are the one who are quite dynamic and mobile, especially in pursuit of jobs and earnings. ,1, This age group is the main breadwinner of their family, and majority of the important works, tasks and traveling chores are performed by the younger population. The enthusiastic nature and casual attitude toward safe driving makes this group quite vulnerable to roadside accidents. Another big factor is the prevalence of chronic drug addiction and alcoholism among the present youth, which is clearly shown by the statistical finding of approximately 46.70% of these polytrauma victims, who arrived in the emergency department with acute intoxication. Majority of the polytrauma victims (63.65%) in our study belonged to the rural background. These statistics highlight one very important aspect that the entire national highways pass through the villages and the shortage of minimum safety barriers is responsible for such accidents. The narrower roads, congested traffic, lack of proper driving sense and attitude, over-speeding, road rage, improper lighting of the roads, lenient legislations and laws related to the punishments for breaking the traffic rules are some of the additional factors which inflate the figures of the accidents. As majority of the population involved in accidents hails from a rural background, adequate measures should be taken at the village level, especially on the highways, to prevent this big menace which accounts for so many lives lost. The majority of the polytrauma patients were riding on motorbikes, which again reflects the increased risk of accidents among two-wheeler riders, especially if they are driving without wearing a helmet which was a statistical finding in almost 48% of the two-wheeler victims. Though the numbers of victims were comparable between the cyclists/pedestrians and four-wheeler passengers, a statistically significant difference could not be derived from these facts. Fall from a height also accounted for 4.9 of the polytrauma patients, while stab, gunshot, machine injuries, etc., accounted for 6% of the total polytrauma patients. The construction of new massive buildings in and around the institution was mainly responsible for the accidents related to the fall from a height and machine injuries. Our institution has launched various social awareness programs in the adjoining villages for the improvement of emergency health care with coordinated efforts from the village leaders. These programs encourage increased participation of villagers in helping the timely transportation of emergency cases to the hospital, enforcing the respect for traffic laws and legislations at their respective villages, early medical assistance for drug addicts and alcoholics, encouraging blood donation practices, increased coordination in strengthening the health services at village levels, etc. Similar efforts by other health centers can tide over the present public health crisis to a large extent and can strengthen our national health programs at grass-root level. We have launched various programs and health schemes at our institute, especially for the economic backward sections, in line with national programs and missions, and the administrators are in continuous touch with the state and central governments for smoother implementation and functioning of these health benefit schemes. The golden hour concept is very important when dealing with any type of emergency case. The average mean time of arrival of these patients from the site of accident to the hospital and the beginning of initial resuscitation was 21.68 min. We have provided four ambulances to police and social organizations at various focal points for the early transportation of trauma victims, along with the helpline numbers of the hospital. The prognosis of patients with polytrauma and blunt or penetrating injuries generally gets improved if they get a timely treatment and support of intensive care facilities. , We recorded a mean GCS of 9.7 among our patents. The lower value of GCS can primarily be ascribed to the large number of patients having been admitted with altered sensorium associated with head injuries and the alleged alcohol intake. The degree of head injury varied from mild to severe along with associated maxilla-facial trauma in quite a few patients. A large number of patients underwent emergency surgical operations within the first 6 hours. The main factors mandating emergency intervention and exploration included abdominal viscus injury and head trauma with progressively deteriorating clinical condition. The decision for operative intervention in polytrauma patients has to be taken with absolute clinical precision keeping in mind the damage control concept. This concept dictates that the patient's clinical condition is optimized first before undertaking any operative intervention for life-threatening injuries. Majority of the patients who presented with hemorrhagic shock had multiple fractures of the long bones and intra-abdominal bleed. Out of 273 patients, 37 died during initial resuscitation in spite of all the dedicated efforts our trauma team. Majority of our polytrauma victims were referred from the smaller private clinics after administration of primary first aid care. These nursing homes do not admit patients as such because of shortage of adequate trauma resuscitation facilities and infrastructure as well as a fear of medico-legal implications. Even during the initial stages of the establishment of our institute, many patients left against medical advice, which revealed a lack of awareness among the lesser educated rural population, poverty and non-coordinated efforts of our hospital staff, as a result of which trauma care management team came into existence. There is an urgent need for proper implementation ofpre-hospital and advanced trauma life support measures at grass-root level. Analyzing the profile of polytrauma victims at a national level and simultaneously improving the trauma care services at every health center are very essential to decrease the mortality and morbidity due to accidents. The improvement can be augmented further by strengthening the rural health infrastructure, strict traffic rules, and increasing public awareness. No matter how many studies are undertaken in defining and re-defining the profile of polytrauma patients, but the underlying one big fact is that no improvement in the management of these salvageable patients can be made without a multimodal approach and well-coordinated efforts between the government and various other agencies, both private and public. These co-ordinated efforts should aim at precise identification of the weaknesses and shortcomings in the existing polytrauma care management system and then chalk out plans and policies to effectively handle the growing menace of polytrauma at a much larger level, specifically in the rural areas. 1. Nantulya MV, Reich MR. The neglected epidemic: Road traffic injuries in developing countries. BMJ 2002;324:1139-41. 2. Goyal S, Sancheti KH, Shete KM. Poly Trauma in rural India: Changing trends. Indian J Orthop 2006;40:259-61. 3. Gururaj G. Road traffic deaths, injuries and disabilities in India: Current scenario. Natl Med J India 2008;21:14-9. 4. Gillham MJ, Parr MJ. Resuscitation for major trauma. CurrOpinAnaesthesiol 2002;15:167-72. 5. Keel M, Trenta O. Pathophysiology of polytrauma. Injury 2005;36:691-709. 6. Joshipura MK, Mock C, Goosen J, Peden M. Essential trauma care: Strengthening trauma systems round the world. Injury 2004;35:841-5. 7. Bickell WH, Wall MJ, Pepe PE, Martin RR, Ginger VF, Allen MK, et al. Immediate versus delayed fluid resuscitation for hypotensive patients with penetrating torso injuries. N Engl J Med 1994;331:1105-9. 8. Krug EG, Sharma GK, Lozano R. The global burden of injuries. Am J Public Health 2000;90:523-6. 9. Chiara O, Scott JD, Cimbanassi S, Marini A, Zoia R, Rodriguez A, et al. Trauma deaths in an Italian urban area: An audit of pre-hospital and in-hospital trauma care. Injury 2002;33:553-62. 10. Ali J. Effect of the prehospital trauma life support program on prehospital trauma care. J Trauma 1997;42:786-90. 11. Marson A, Thomson J. The influence of prehospital trauma care on traffic accident mortality. J Trauma 2001;50:917-20. 12. Hauswald M, Yeoh E. Designing a prehospital system for a developing country: Estimated cost and benefits. Am J Emerg Med 1997;15:600-3. 13. Khajuria B, Sharma R, Verma A. A profile of the autopsies of road traffic accident victims in Jammu. J ClinDiagn Res 2008;2:639-42. 14. Tisherman SA, Barie P, Bokhari F, Bonadies J, Daley B, Diebel L, et al. Clinical practice guidelines: Endpoints of resuscitation. J Trauma 2004;57:898-912. 15. Ghosh PK. Epidemiological study of the victims of vehicular accidents in Delhi. J Ind Med Assoc 1992;90:309-12. 16. Sauaia A, Moore FA, Moore EE, Moser KS, Brennan R, Read RA, et al. Epidemiology of trauma deaths: A reassessment. J Trauma 1995;38:185-93. 17. Kual A, Sinha US, Pathak YK. Fatal road traffic accidents, study of distribution, nature and type of injury. J Indian Acad Forensic Med 2005;27:71-6. 18. Miller RS, Morris JA Jr, Diaz JJ Jr, Herring MB, May AK. Complications after 344 damage-control open celiotomies. J Trauma 2005;59:1365-71. 19. Levy MM, Rapaport J, Lemeshow S, Chalfin DB, Phillips G, Danis M. Association between critical care physician management and patient mortality in the intensive care unit. Ann Intern Med 2008;148:801-9. 20. Mirski MA, Chang CW, Cowan R. Impact of a neuroscience intensive care unit on neurosurgical patient outcomes and cost of care: Evidence-based support for an intensivist-directed specialty ICU model of care. J NeurosurgAnesthesiol 2001;13:83-92. 21. Diringer MN, Edwards DF. Admission to a neurologic/neurosurgical intensive care unit is associated with reduced mortality rate after intracerebral hemorrhage. Crit Care Med 2001;29:635-40. 22. Young MP, Birkmeyer JD. Potential reduction in mortality rates using an intensivist model to manage intensive care units. EffClinPract 2001;3:284-9. 23. Suarez JI, Zaidat OO, Suri MF, Feen ES, Lynch G, Hickman J, et al. Length of stay and mortality in neurocritically ill patients: Impact of a specialized neurocritical care team. Crit Care Med 2004;32:2311-7. 24. Russell D, VorderBruegge M, Burns SM. Effect of an outcomes-managed approach to care of neuroscience patients by acute care nurse practitioners. Am J Crit Care 2002;11:353-62. 25. Nathens AB, Rivara FP, MacKenzie EJ, Maier RV, Wang J, Egleston B, et al.The impact of an intensivist-model ICU on trauma-related mortality. Ann Surg 2006;244:545-54. 26. Pronovost PJ, Angus DC, Dorman T, Robinson KA, Dremsizov TT, Young TL. Physician staffing patterns and clinical outcomes in critically ill patients: A systematic review. JAMA 2002;288:2151-62. 27. Rosenfeld BA, Dorman T, Breslow MJ, Pronovost P, Jenckes M, Zhang N, et al. Intensive care unit telemedicine: Alternate paradigm for providing continuous intensivist care. Crit Care Med 2000;28:3925-31. 28. Talving P, Palstedt J, Riddez L. Prehospital management and fluid resuscitation in hypotensive trauma patients admitted to Karolinska University hospital in Stockholm. Prehosp Disast Med 2005;20:228-34.